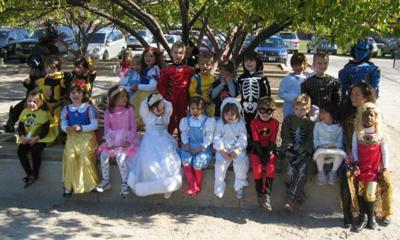 For the past 3 years we have done a neighborhood Halloween carnival. Games are set up with small prizes. You can sell tickets to play the games. Food and drinks are also available. We hand out awards for best costume. 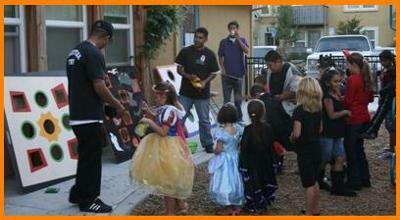 The children also go to each food/craft/merchandise vendor to trick or treat. It's become pretty popular. We try to make it last an evening however there is thought of making it 2 evenings this year. All proceeds go to benefit the local elementary school. If you have a larger school it's easier. More rooms means more ideas and things to do. Make sure to use your cafeteria as well as gym for sales as well as any games or contests. There are many companies you can buy small prizes from in bulk for a low price. Wow, Beckley, West Virginia, what a great small town festival! We liked that this benefits the local public school. Most of them need all the financial help they can get. It seems to us that others can learn from this experience that leveraging major holidays into occasions for your community gatherings is a great idea. For our international visitors, and there are many now, we explain that Halloween is a "holiday" (although it's not a work or school day off yet) for dressing in costume and fooling around with spooky things such as witches and ghosts. There is also a custom of going door to door to gather treats. It's about the third biggest holiday in the U.S. now in terms of spending money. So to use this holiday that's becoming very popular to work together to build social capital is very good for small towns. Social capital can be explained easily as introducing your network to my network, thereby building social capital. It's real work to put on a good carnival, with games, contests, costumes, food, and things to sell. But working together builds community spirit. We hope you're also attracting some people from nearby towns as they hear about your great carnival. Then they spend some money in your town, hopefully a little at the local small businesses as well as at the school carnival.